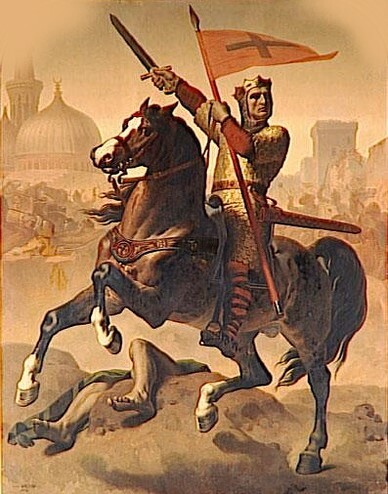 Godfrey of Bouillon was a Frank born in about the year 1060. He is best remembered as one of the leaders of the First Crusade that ended with the liberation of Jerusalem, and where he was made the first ruler of the newly created Kingdom of Jerusalem. Becoming a knight, Godfrey was given the territories of Bouillon and the Margraviate of Antwerp by Emperor Henry IV as a sort of test of his capabilities and fealty. Godfrey proved himself, fighting side by side in battle with the emperor against Rudolf, Duke of Swabia. Over the next few years he continued to prove himself as he struggled to defend his own lands against a myriad of enemies, demonstrating his martial ability and loyalty to Henry IV, who had enough confidence in him to give him his duchy of Lower Lorraine. When Pope Urban II called for the Crusade in 1095, Godfrey was one of the first leaders to respond, answering whole-heartedly by selling or taking out loans on his lands to finance the crusade. Thousands of knights enthusiastically responded to the call, hoping to take back the Holy Land and relieve the Byzantine Empire, which was under a great deal of pressure from the Moslems. 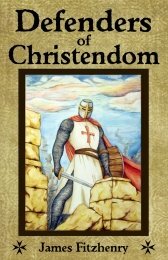 Godfrey fielded a large army of about 40,000 men, although there were several other armies gathering throughout Christendom at the same time under different leaders. They would meet at the capital of the Byzantine Empire, Constantinople, and continue on from there. Emperor Alexius I was not so interested in freeing Jerusalem as he was with using these thousands of knights Christian knights and infantry to push back the Seljek Turks and help him regain his own lands. He asked the Crusaders to swear an oath of loyalty to him, and all but Tancred swore some type of modified oath promising to help return some of his former possessions. The first major objective was Nicaea, and in the spring of 1097 the crusaders lay siege to the city. After a great deal of labor and investment, the Crusaders could do nothing but watch as the city surrendered to the Byzantine general, having made a separate agreement with them that excluded the Crusaders. Many of the Crusaders felt betrayed. Next up came the Battle of Dorylaeum. When Bohemond's army was ambushed by a vastly superior in number Seljuk army, Godfrey led the rearguard to the attack, and with the help of the other Christian princes, defeated the Turkish host. After that came the siege of Antioch in 1098, which was such a difficult campaign that many of the Crusaders deserted, going back to their homelands by way of Constantinople. Alexius I, thinking that the Crusaders would be unable to capture Antioch, betrayed his own oath and refused to send the assistance he had promised them. Thus, once the Crusaders had taken Antioch, they felt their promises to the Byzantine emperor had been voided by his treachery. 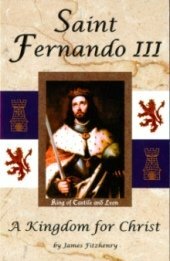 Bohemond, who more than any other man was responsible for the conquest, claimed the city for himself and decided to stay there to secure his prize rather than continue with the rest of the Crusaders to Jerusalem. The Crusaders would not reach Jerusalem until 1099, and before that they would encounter a new enemy – the North African Fatamids. Claiming descent from the daughter of Muhammad, it was they who had sacked Jerusalem the year before, and who intended to defend the city against all comers. In the middle of July, 1099, Godfrey and his knights breached the walls and entered the Holy City, having accomplished what they had set out to do in a relatively short amount of time and despite a variety of difficulties. A council was soon held in the Church of the Holy Sepulcher where Godfrey agreed to become ruler, although he refused the title of “king,” saying, “I will not wear a crown of gold where my Savior wore one of thorns.” The following year he defeated the Fatimids at the Battle of Ascalon, and shortly thereafter became ill and died in Jerusalem.